We’ve another study, this time from Japan, that shows how quickly the 2009 H1N1 pandemic virus jumped from humans back into the local swine population, and how is has since reassorted into several new, distinct hybrid viruses. This is a pattern we’ve observed both here in United States, and elsewhere (see J. Virol: Continued Reassortment Of Swine Flu Viruses With Genes From pH1N1 In China). While we watch avian H5, H7, and H10 viruses with suspicion, over the past 120 years or so only H1, H2, and H3 influenza viruses - the type commonly circulating in pigs – are known to have sparked pandemics. Making emerging swine flu viruses of particular concern, a topic we explored a few weeks ago in Are Influenza Pandemic Viruses Members Of An Exclusive Club? Here in North America we’ve been watching the evolution of several swine variant viruses (H1N1v, H1N2v, H3N2v) over the past few years, all of which have reassorted with - and picked up the M gene segment from – the 2009 H1N1 virus. 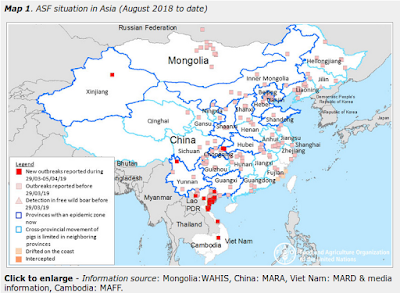 Today’s study is a reminder that once the 2009 H1N1 virus spread globally, it was reintroduced into pig herds (which host varying strains of swine influenza viruses (SIVs) around the world), and has since reassorted into new strains. Strains that continue to evolve – mostly unmonitored – in millions of pigs around the world. Genomic Reassortants of Pandemic A (H1N1) 2009 Virus and Endemic Porcine H1 and H3 Viruses in Swine in Japan. Kirisawa R1, Ogasawara Y, Yoshitake H, Koda A, Furuya T.
1Laboratory of Veterinary Virology, Department of Pathobiology, School of Veterinary Medicine, Rakuno Gakuen University. From 2010 to 2013 in Japan, we isolated eleven swine influenza viruses (SIVs) from pigs showing respiratory symptoms. Sequence and phylogenetic analyses showed that six H1N1 viruses originated from the pandemic (H1N1) 2009 (pdm 09) virus and the other five viruses were reassortants between SIVs and pdm 09 viruses, representing four genotypes. Two H1N2 viruses contained H1 and N2 genes originated from Japanese H1N2 SIV together with internal genes of pdm 09 viruses. Additionally, one H1N2 virus contained a further NP gene originating from Japanese H1N2 SIV. One H1N1 virus contained only the H1 gene originating from Japanese H1 SIV in a pdm 09 virus background. One H3N2 virus contained H3 and N2 genes originating from Japanese H3N2 SIV together with internal genes of pdm 09 virus. The results indicate that pdm 09 viruses are distributed widely in the Japanese swine population and that several reassortments with Japanese SIVs have occurred. As global pig production grows – particularly in places where biosecurity and surveillance may be lax – it creates increasing opportunities for a new, biologically `fit’ swine variant virus to emerge. As you can see by the chart below, swine production is growing fastest in developing countries, where biosecurity is likely to be the least stringent. Although most novel flu viruses are evolutionary failures, with a playground consisting of billions of avian and porcine hosts - and with nature’s laboratory churning out new hybrids 24/7 - the odds of someday seeing another `successful’ swine or avian reassortant emerge and spark a pandemic is considered all but inevitable.